My brother had warned me, "Once you go rice cooker, you don't go back." I had grown up in a household where we cooked rice in a pot, on our stovetop. In college I used a hotpot to the same effect. Then I came to Japan, where a small but mighty appliance forever changed my cooking ways. Although I had had a rice cooker at my disposal upon arrival in my Japanese apartment, I felt reluctant to use it. The kanji labeled buttons intimidated me. It did not appear intuitive. In retrospect, I'm not sure why I worried. What was the worst that could happen? My rice turns to porridge? It took a visit from my brother to teach me the wise ways of the rice cooker. Measure the rice. Dump it in. Wash it. Measure the water. Dump it in. Press the big red button. Go enjoy life until you hear "Twinkle, Twinkle Little Star." Enjoy perfect rice every-time. But that's not all. New models push the limits of the term "rice cooker." Equipped with features like magnetic fields, fuzzy logic and artificial intelligence, and with cooking versatility ranging from stew to bread, today's rice cookers are the go-to kitchen appliance. So forget the microwave and give your gas bill a break. Join us as we compare models and features and decide which rice cooker is best for you. If you're still feeling reluctant, don't be (like I was). 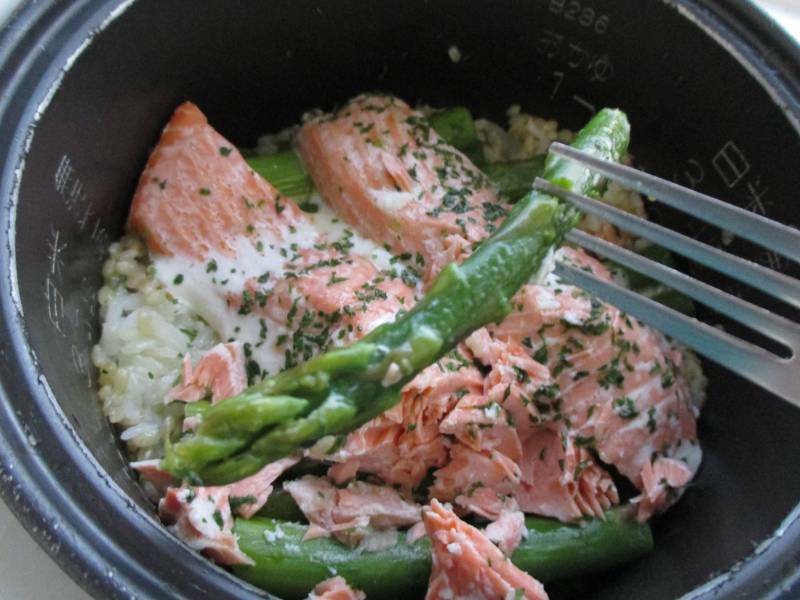 Learn to stop worrying and love the rice cooker. Sometimes referred to as denshijaa 電子（でんし）ジャー or suihanki 炊飯器（すいはんき） rice cookers were born out of Japan's post-war revival. Before then, people cooked rice on kamado, large stoves made to accompany giant pots. Hajime choro choro, naka pappa, butsu butsu iu koro hi o hiite, instructs the cook to begin at low heat, then increase the heat, and then lower the heat again when the inside of the pot begins to bubble. The post-war period left companies scrambling for new commodities. With cash scarce, rice was also accepted as payment. War factories closed down and left Japan with plenty of electricity but few ways to utilize it. 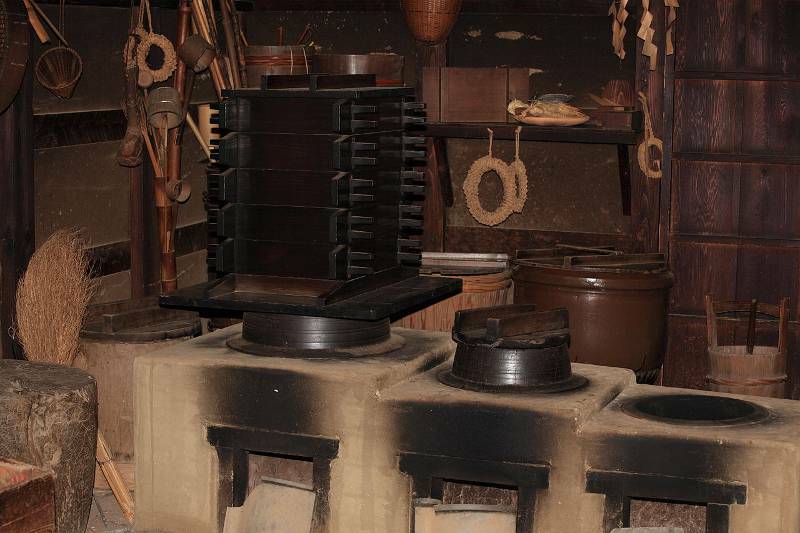 These two factors would soon lead to a rice cooking revolution. At the time Sony focused on modifying and repairing radios built to strict wartime specifications (like limited stations), but looked to expand. How could they take advantage of the electrical productivity of a rice-fed nation like Japan? The (first) electric rice cooker, made by merely interlocking aluminum electrodes which were connected to the bottom of a wooden tub, was a primitive product. The result depended heavily on the kind of rice used and the weight of the water. Tasty rice was a rarity, as the rice cooker produced mostly undercooked or overcooked rice. It was a memorable first failure. But Sony wasn't the only company dreaming of a convenient rice cooking apparatus and thanks to competition, the quality of rice cookers improved. 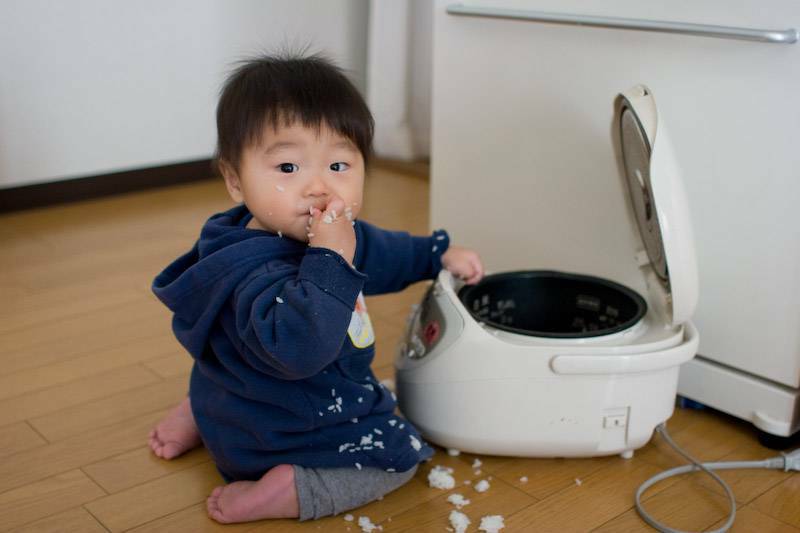 According to Kids Web Japan, Toshiba would release the first commercially successful rice cooker in 1955. After much trial and error, the company came up with a method called "double-pot indirect cooking," in which a cup of water was poured into the outer pot, and the machine automatically turned off when all of this water evaporated, signaling that the rice was ready. Because of how they drastically altered the standard of living for households in the 1950's, Japan dubbed the refrigerator, television and washing machine The Three Treasures. The rice cooker could have easily been declared the fourth. The convenient appliance became a cultural mainstay, offering safely cooked, delicious rice while rendering the more dangerous, inconsistent kamado obsolete. Competition between brands meant rice cookers would continue to improve. For example, "in 1960, the first rice cookers that could keep rice warm after it was cooked went on sale, as did some models with timers." Rice cooker technology continues to march into the future, cooking rice faster while bringing out the best taste. Old machines relied on simple mechanical settings, ignoring factors that are now considered like air pressure, weight, temperature and planetary alignment (okay, maybe not the last one). Technological advancements have even made direct heating obsolete. Induction heating or "IH" (for those in-the-know) became the industry standard. Here's how an IH cooker works. An electric current is passed through coils around the pot. This produces a magnetic field, which in turn produces an electric current in the pot's metal. Metal heats up when an electric current runs through it, so the entire pot quickly rises to a high temperature and cooks the rice evenly. Fuzzy logic has to do with mathematical sets, or groups of items known as elements. In most mathematical sets, an element either belongs to the set or it doesn't. For example, a sparrow would belong to a set of birds, but a bat wouldn't. In fuzzy logic, though, elements can belong to sets in varying degrees. So since a bat has wings, it might belong to a set of birds — but only to a certain extent. Fuzzy logic is basically a way to program machines so they look at the world in a more human way, with degrees of truth. 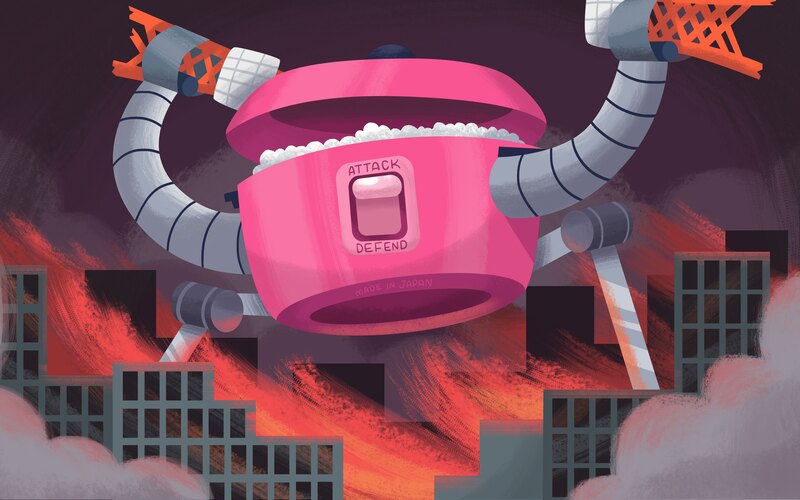 Fuzzy logic allows rice cooker to make "judgement calls" based on collected data and rewards its owners with consistently delicious rice, despite life's variables. Zojirushi tells me that (its rice cooker) learns from each cooking experience so as to adjust to your cooking idiosyncrasies. I didn't ask, so I'm not sure what rice cooking behaviors it "learns" from, but I imagine it could adjust to variables that may stay constant for each particular user: i.e. different brands of rice, the moisture in your climate, the particular chemistry of your water. I'm hoping for a "smart" rice cooker I could control with a phone app. Or at least a talking rice cooker, similar to HAL from 2001 Space Odyssey that could create well balanced meals on its own. "Dave, your rice is ready. Please eat before it gets cold." 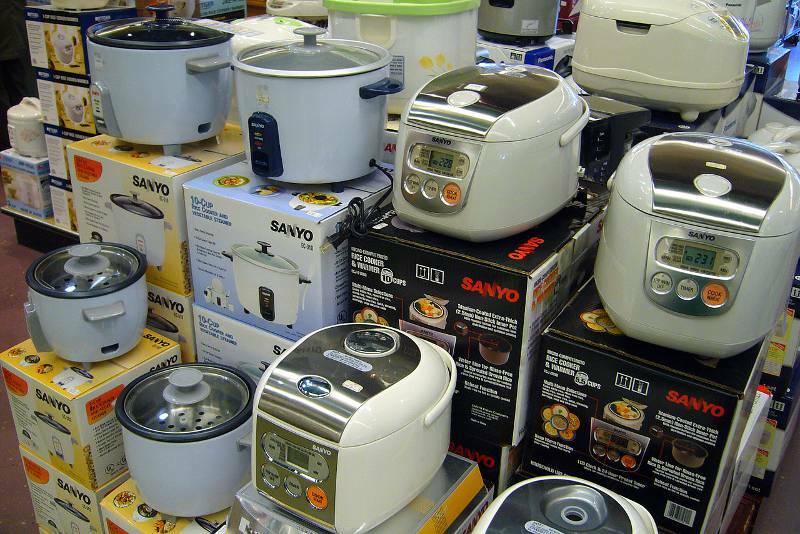 Rice cookers come in various shapes and sizes. Choose a model that best fits your lifestyle. If you're single, the smaller the better, no need for a family-sized behemoth. But if you have a family or plan on hosting parties, go big! Even the cooking pots vary. Some have chemically treated, nonstick surfaces to make cleaning easy. Aluminum is also a popular option. But if you want to avoid those surfaces, for their purported health detriments, go with a more natural option like steel or clay. Of course, some rice cookers boast more features than others. Even those made strictly for cooking rice often feature multiple rice cooking settings. Making brown rice? Hit "brown." Feeling under the weather and need some kayu rice porridge? Hit the special button. A clock and timer add to a cooker's convenience. Other models even feature digital screens for detailed options and settings. Why mention it twice? Because a timer is a rice cooker's must-have feature. Set it before you go to bed to have fresh rice in the morning. Set it when you head off to work to have fresh rice waiting when you get home. Rice cookers now take cooking convenience to the next level and smash the excuse, "I don't have time to cook." You can steam some veggies, broccoli or barbecue some meat and have a healthy, fresh, affordable home cooked meal in minutes. And with some rice cookers, you can cook it all at the same time in the same appliance! If you want to cook more than rice, you could take your chances with a standard "rice only" model, but its cooking settings and rice-centric fuzzy-logic might make for over cooked, mushy meals. But don't fret, many of today's "rice" cookers accommodate multipurpose needs. Special cooking settings make cooking soups, stews and even steaming vegetables and meats as easy as the push of a button. Some rice cookers feature special steaming trays. Others double as crock pots and pressure cookers. With the help of a timer you can prepare all of your ingredients in the morning, set the timer and have a well balanced scrumptious meal waiting for you when you get home. One of my current models, the Vitaclay 2-in-1 Rice N' Slow Cooker, has special settings for making stew and soup (I can smell the tomato and chicken stew stewing as I write!). On top of all of the shapes, sizes and technological advancements and features, rice cookers also feature charm. Although I love my Vitaclay, my Zojirushi takes the prize for charm. For one, it has a convenient, self winding plug that stores internally and never gets in the way. There's also a removable container to catch spill water from the lid. But best of all, the Zojirushi plays "Twinkle Twinkle Little Star" when the rice is done. The rice cooker universe is surprisingly vast. Please examine all the options (and read the next section) before buying one! Now that we've covered the appliance's history, technology and features it's time to look at specific models. Which will come out on top? You be the judge! The Zojirushi NP-NVC10/18 is the top-of-the-line, rice connoisseur's model. The giant (15.4 x 10.1 x 8.6 inches, 13 pounds) NP-NVC10/18 flashes some bling in its a "platinum infused nonstick coating." Apparently this coating makes for the best rice which is the NP-NVC10/18's goal. The model features both fuzzy-logic and AI and takes pressure into account. Settings allow users to make the rice as soft or hard as they prefer, and rice can even be toasted and crispy with the NP-NVC10/18's "scorch" setting. The clock and timer means you can have your preferred style of rice when you want it. The top of the line, this rice cooker comes in sizes and price ranges to match. If rice cookers equalled street cred, MC's would be rhyming about the NP-NVC10/18 instead of spinners and medallions. Although it lacks versatility in terms of cooking foods other than rice, if you want awesome rice prepared nearly any way (brown, gabba brown, scorched, umami, sushi rice, or porridge), the NP-NVC10/18 is the model for you. The Panasonic SR-DE103 is a well balanced model with a few extra features at a great price. Fuzzy logic helps the SR-DE103 alter the cooking time to net delicious rice every time. Although its choices in rice cooking settings pale in comparison to the NP-NVC10/18, it features a steam tray and steam and cake push-button settings that give it the edge in versatility. It's also more compact (13 X10 X8 inches), making it easier to store. With a timer that lets you have rice when you want it the Panasonic SR-DE103 offers what's expected of a traditional rice cooker with a few convenient features. Priced under $100, the Panasonic SR-DE103 offers a high end cooker at a more affordable price. The Aroma Digital Rice Cooker and Food Steamer offers easy, one button controls (white rice, brown rice, keep warm and steam). It comes in various sizes so you can choose one that suits your needs. Like the Panasonic SR-DE103, the Aroma Digital features a black nonstick coated aluminum cooking pot. It also has a special "steam" setting that allows users to steam vegetables in the fitted tray while cooking rice. Take advantage of the timer to have balanced meals ready when you need them! What's the difference between the Aroma Digital and Panasonic SR-DE103? Size, shape and material. The Panasonic SR-DE103 is a rectangular plastic box. The Aroma Digital is a round, crock-pot styled rice cooker with a stainless steel shell (8.7 x 8.5 x 9.3 inches for the 8-cup model). VitaClay's claim to fame is its clay pot; a natural, stick-free alternative to most rice cooker pots' artificial coatings. Although I love the clay pot, it can be a double edged sword. If you tend to drop things, the breakable clay pot might prove problematic. Although extra pots can be purchased online, it'll cost you. But for the sure-handed readers out there, the clay pot is easy to clean and won't pell after prolonged use like non-stick coated pots do. It also presents a nice aesthetic when it's carried to the dining room table! The VF7700-6 Chef encourages experimentation; its stew and soup settings work well in preparing curries, sauces, as well as ANY types of soups and stews. My only gripe is its lack of a steam tray. Like the Aroma Digital Rice Cooker, the VitaClay comes in a crock-pot styled shape. As the Japanese-English phrase goes, sometimes "Simple is best." And in the case of the Aroma Simply Stainless, it's cheap too. This no-nonsense model features a lid, pot and plastic casing. A bare bones rice cooker, Aroma's Simply Stainless line comes in three sizes and one touch simplicity. The pot is made from surgical-grade 304 stainless steel, so it's a great option for those looking to avoid aluminum and chemically coated surfaces. The pot also boasts the ability to cook soups, stews, chili and oatmeal. Although some reviews complain about steam and water spurting from the hole on the lid, the reviews are overwhelmingly positive. 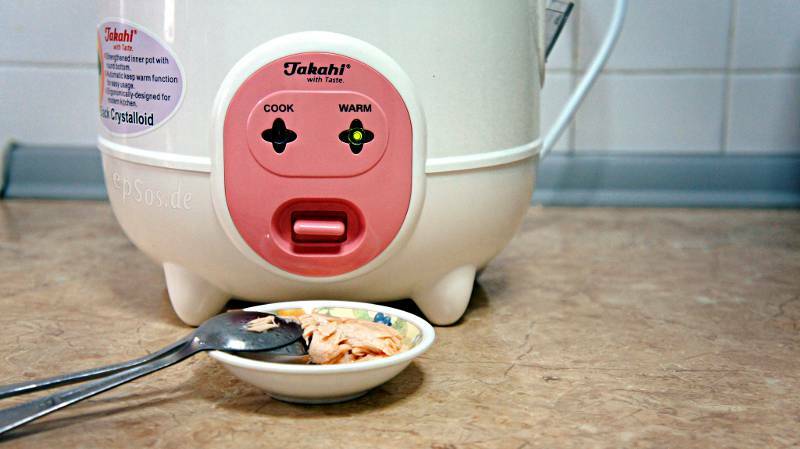 Want a no-fuss, affordable and tiny rice cooker? The Aroma Simply Stainless is your best bet! When I first arrived in Japan I asked a Japanese acquaintance, "Can I cook brown rice in my rice cooker?" "Oh… you better not," she warned. Japanese take their white rice very seriously, and I've heard the myth repeated time and time again, "Rice Cookers are for white rice." But nothing could be further from the truth. I've cooked brown rice, beans, and even fish and vegetables in a rice cooker only meant for rice. Slight odors and staining of the white plastic shell proved to be the only downsides. Whether cooked through induction heating, fuzzy logic, or artificial intelligence, at its very core a rice cooker is a heated pot. Like some of the models mentioned above, many rice cookers are moving to multi-functionality. And taking advantage of these features can be simple and fun. A simple Youtube search reveals all sorts of things that can be cooked in a rice cooker – from various types of rice to pasta, eggs, pancakes, cake and bread. 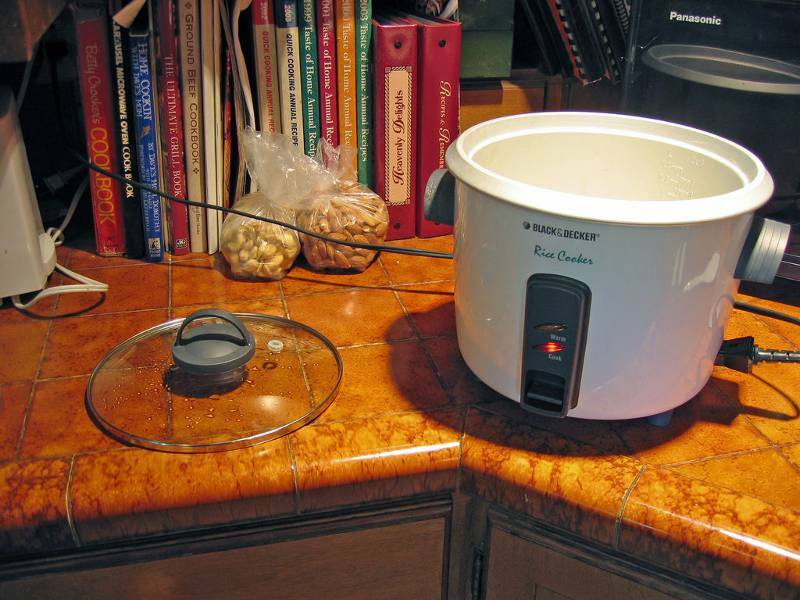 Resources to help you become a cooking everything-other-than-rice rice-cooker master. A site offering tips on how to prepare the perfect rice as well as various rice-based dishes, Karate Rice proves anyone can cook for themselves. I recommend the "Japanese Sweet Potato and Rice" and "Rice Chili Stew." Add extra garlic and cumin to the stew to give it more zing! A less traditional collection of recipes that often abandons the rice altogether. Although Mac and Cheese is always popular, I love the Vegetable Frittata as a quick, well balanced meal. Just looking at the "Tofu and Asparagus's" deep green asparagus, soft brown tofu cubes and rich broth made my mouth water. The Bark.com offers all sorts of articles aimed at dedicated dog lovers. It even features a recipe for dog food (though I'm considering trying it as people food) made in a rice cooker. Instead of cooking with a dog, cook for a dog! With the subtitle, 250 No-Fail Recipes for Pilafs, Risottos, Polenta, Chilis, Soups, Porridges, Puddings, and More, Beth Hensperger and Julie Kaufman's book puts cooking within reach of even the most inept household chefs. Learn to make risotto, chunky or smooth applesauce, tapioca pudding, and hot breakfast cereals. Although I haven't run into any problems myself, reviewers say this book nets the best results with fuzzy-logic models. Bask in the Glory of Well Cooked Rice! More versatile than the name implies, rice-cookers are clean, safe, and super convenient! After not using one for most of my life, aside from the refrigerator it has become the most used appliance in my kitchen. I don't even own a microwave, toaster or oven anymore and have no plans on investing in any of them. Don't get me wrong, the rice cooker can't outperform those appliances, but for me it's an acceptable alternative. Rice cookers make cooking easy. Timers and extra features can make cooking convenient for even the busiest of people. Best of all, it's easy to make healthy, well balanced meals. Plus experimenting with new recipes is fun and (usually) rewarding. If you have a rice cooker to recommend or recipes or recipe websites, please comment below. Happy rice (and everything else) cooking to all!